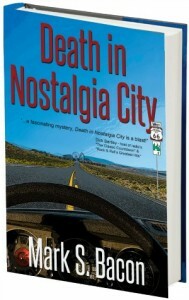 The following is a guest post by Mark Bacon, author of Death in Nostalgia City. If you would like to write a guest post on my blog, please send me an e-mail at contact@cecilesune.com. Agatha Christie’s Jane Marple belongs in an English drawing room in St. Mary Mead or perhaps somewhere in Cornwall. Author Raymond Chandler often stuck Philip Marlow in some dark alley in LA. Robert B. Parker’s Spenser inhabited the mean streets of Boston. Mystery novelists frequently use locales to establish a mood or theme or to provide an intriguing background for their detectives, so when I started my debut thriller, I considered the locale carefully. In fact, Death in Nostalgia City, contains a locale within a locale. The setting of a novel can provide vivid mental pictures to help you become involved in the story. It can even influence the course of events. Venice, Italy, is the setting for American author Donna Leon’s Commissario Guido Brunetti mysteries. The canals, apartments and restaurants of this water-logged city almost become another character in the book as a result of Leon’s evocative prose. If you’ve ever read one of James Lee Burke’s mysteries featuring Dave Robicheaux, you know that the bayous of Louisiana often form a foreboding backdrop to the action. Death in Nostalgia City is set in a fictional, retro theme park in northern Arizona. I came up with the park first, then decided to put it in Arizona. Early in my career I was an advertising copywriter for Knott’s Berry Farm, a large southern California theme park. Seeing a theme park from the inside gives you an appreciation for its complex infrastructure. It’s also interesting to see how spooky a theme park can be after hours when the rides are shut down and everything is quiet and shrouded in shadow. I thought it would be the perfect setting for a mystery/thriller. Nostalgia City is a different kind of theme park. It’s a meticulous re-creation of an entire small town as it would have looked in the late 1960s through early 1970s. The park is complete with period cars, shops, clothes, hairstyles, music, restaurants, fads, food and movie theaters. The park covers several square miles and includes an amusement area with rides, many of which are inspired by 60s-70s movies and TV shows. Selecting northern Arizona for the location of the theme park was easy. First, since Nostalgia City covers several square miles, I had to pick somewhere with lots of open, inexpensive land. I also needed a city of some size relatively nearby so that people could get air transportation to and from. Flagstaff serves that purpose and Phoenix, about two hours away, offers even more transportation options. The second reason for choosing the high desert of northern Arizona was Route 66. Remnants of the “Mother Road,” made famous in a popular song and a 1960s TV series, stretch across northern Arizona and tie in beautifully with Nostalgia City’s retro theme. My main characters are suited to the setting. Lyle Deming, from Phoenix, and Kate Sorensen, from Las Vegas, are both comfortable in the hot desert environment. And Lyle, a late baby boomer, revels in retro reminiscences, quoting lines from old songs and movies that sometimes mystify his younger partner. So as Sam Spade had San Francisco and Sherlock Holmes, London, Lyle Deming has Nostalgia City. About the author and his work: Mark Bacon’s Website. 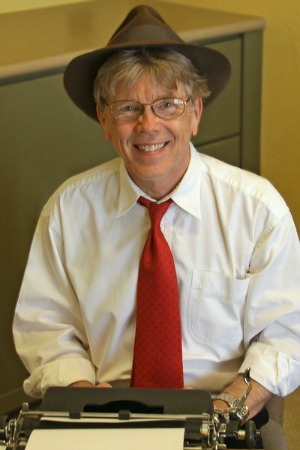 Mark Bacon’s articles have appeared in the Washington Post, Kansas City Star, Denver Post, USAir Magazine, Trailer Life, Cleveland Plain Dealer, San Antonio Express-News, The Orange County Register, Working Woman, and other publications. He is a former columnist for BusinessWeek Online and most recently was a regular correspondent for the San Francisco Chronicle where he wrote on travel, outdoors and entertainment. Bacon is a former president of the Orange County Chapter of the International Association of Business Communicators. He and his wife, Anne, and their golden retriever, Willow, live in Reno, Nevada. Did you know that Agatha Christie had a learning disability called dysgraphia?